Fake news is false information or propaganda disguised as real news. Purveyors of fake news make things up, omit information that doesn’t support their position, and use outrage-producing headlines. Satire is fake news meant to entertain, rather than deceive, but it is sometimes misinterpreted as real reporting. Fake news can come from any media channel, but it has been particularly problematic on social media. 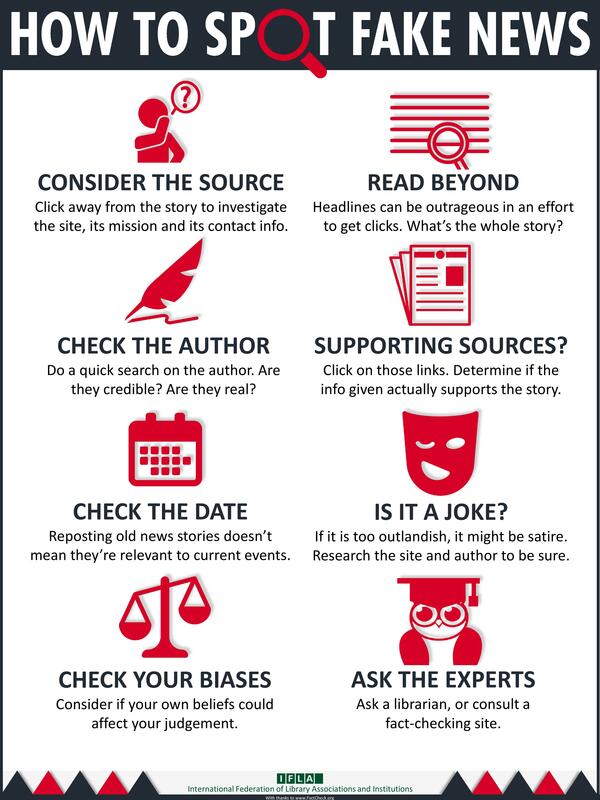 The following guides provide more information on fake news. Fact-checking Web sites can help you evaluate statements and news stories. Consider the following when consulting a fact-checking Web site. Is documentation provided? Do references and original documents support analysis. What's the track record? Is there a history of reliability, recognition or awards? Information borrowed from : Batchelor, O. (2017). Getting out the truth: The role of libraries in the fight against fake news. Reference Services Review, 45(2), 143-148.